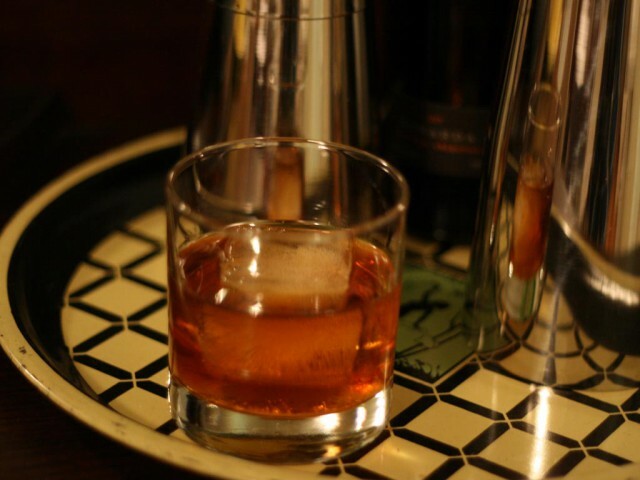 Combine maple syrup, cinnamon syrup, and bitters in the bottom of an Old Fashioned glass and stir to mix. Fill glass with ice and add bourbon. Stir until cold. No garnish. This recipe was inspired by the Deliverance cocktail served by my neighborhood bar, Night Light. The Deliverance is made with maple syrup and bourbon, I don’t know in what quantities, and garnished with a cinnamon stick. While the Deliverance is a good drink, it tends to be a little on the sweet side. While experimenting with variants at home, I hit upon this combination that I think works much better. The cinnamon is more pronounced in my version, but not so much that the maple is overwhelmed. We’re using two sweetening agents here but the amounts are low enough that it’s still not a sweet drink, no more so than a well-made Old Fashioned. Your choice of whiskey will influence that a bit too, of course. I use Bulleit bourbon for these and it works very well. 1. BG Reynolds’ syrups were formerly sold under the brand Trader Tiki. The syrups are unchanged. Combine ingredients in an ice-filled mixing glass and stir until cold. Strain into a chilled cocktail glass. Optionally garnish with an orange zest and piece of pineapple. 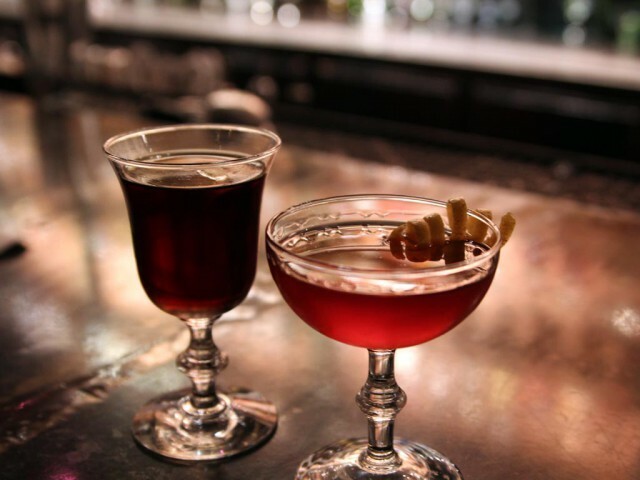 The El Presidente was created in Havana in the 1920s and is reportedly named for General Carmen Menocal, the president of Cuba before Batista. It’s one of those drinks you’ll see made a little differently each time. This particular recipe was suggested by the team at Denizen Rum, who also supplied me with the bottle seen above, and it was further slightly modified by my use of BG Reynolds Hibiscus Grenadine instead of regular. An extremely minor change, that, only done because that’s the grenadine I happen to have on hand (and really, who needs more than one bottle at a time?). I tried versions of this cocktail using both bianco vermouth and the dry vermouth found in the original recipe (both Dolin). When using dry vermouth, the drink benefits from increasing the amount of rum by 1/4 ounce or so, but it works well either way. 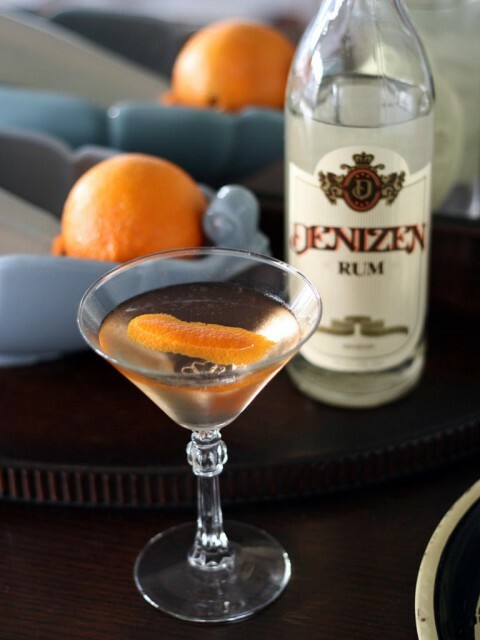 As for the rum, Denizen is a new silver rum, introduced in New York around this time last year and now starting to make its way out across the country. It’s aged two to five years in oak, then charcoal filtered so the finished spirit is perfectly clear with a nice smooth finish. At $16 it’s a great option for your general-purpose silver rum. I have it on good authority that Denizen also makes a good Negroni variant, using it in place of gin. I’ve done that with Novo Fogo silver cachaça but never rum, so you may see another Denizen cocktail post coming up soon. 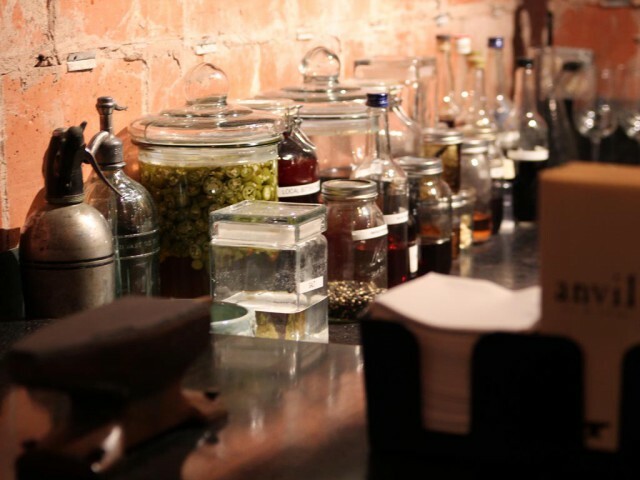 Anvil is a bar whose reputation precedes it, even all the way up here in Portland. I first became aware of their existence in 2009 when their list of cocktails everyone should try at least once made the rounds of the online liquorati. Like everyone else in the boozeosphere, I noted Anvil as a must-visit bar in the unlikely event I ever visit Houston and started marking drinks off the list. As it happens, almost exactly two years later I found myself in Houston on unrelated business and naturally took the opportunity to check out this bar I’d heard so much about. We rented an apartment in Houston’s Montrose neighborhood where Anvil is located and eagerly looked forward to our first visit. Preferring to avoid the crowds, we opted to go on a Sunday evening around 8:00pm. Walking into the bar we found the scene nice and quiet and took a couple seats toward the center of the long bar, which was amply staffed by three bartenders. The interior space is rectangular and is done up in wood, steel, and brick. The entrance is one of the short sides of the room; the bar spans most of the longer left side and the right side, facing the street, is all windows. The menu was impressive. After much consideration, our first round consisted of a Tin Pan Alley for Sarai (hazelnut-infused bourbon, lime, orgeat) and Smoke & Mirrors for myself. Both were nice but the Smoke & Mirrors really blew me away. 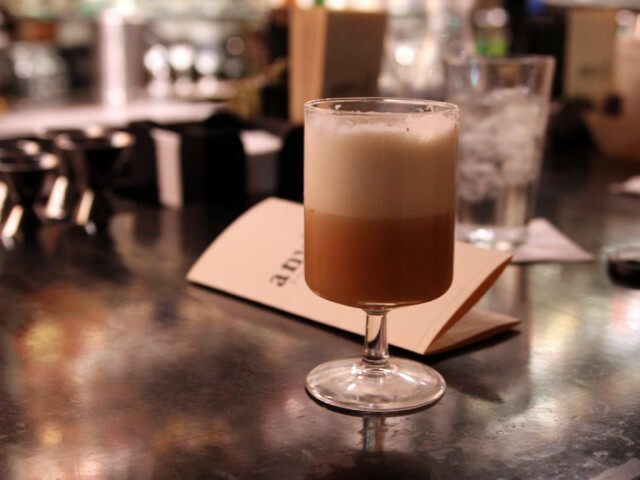 Made with rye, Fernet Branca, cacao, lemon juice, black peppercorn, and egg white, the drink is described in the menu as “a richer, herbal whiskey sour”. It was a great way to start off the evening’s menu explorations. For our second round, Sarai decided on Eve’s Downfall, made with rum, Don’s Spices #2, lemon, sage, and apple cider, while I had The Brave, a bitter, smoky mix of mezcal, sotol, Averna, curaçao, and Angostura bitters. We had plenty of time to make our choices; none of the three bartenders asked once how our drinks were doing or whether we would like another round, even after our glasses were empty ten minutes or so. We eventually had to flag one of them down from the other end of the bar where they were talking to each other and some friends at the rail. Sadly, this was repeated when it was time for our third round (an Improved Whiskey Cocktail for myself and an Italian Bootstrap for Sarai). We spent around two hours at Anvil this evening. 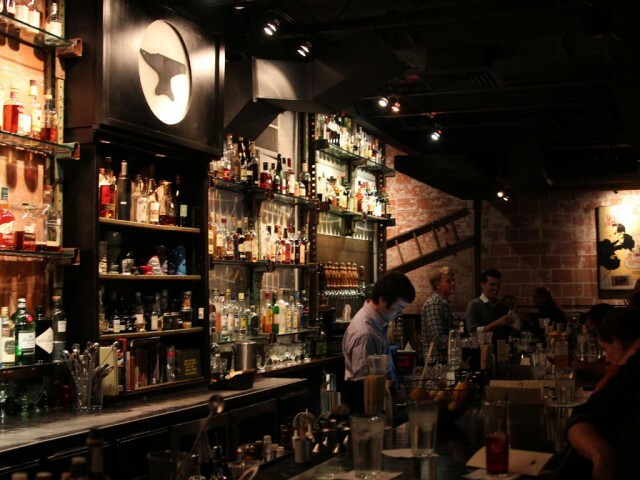 While all our drinks were very well made and quite delicious, our experience at Anvil was slightly marred by the inattentive and seemingly disinterested service. I understand that bartenders are sometimes simply too busy to chat or even pay attention to everyone at the bar, but with three bartenders on duty and a peak of around 15 customers in the bar at any given time, I don’t expect to wait ten minutes to order a drink when both our glasses are empty. A little small talk once in a while would be nice too. Sure, they were all pleasant enough when we spoke to them, but none seemed interested in more than the bare minimum of small talk that politeness requires. So if you’re in the area, by all means stop in to Anvil. The cocktails won’t disappoint (and hopefully the service won’t either). Combine liquid ingredients in a cocktail shaker without ice. Separate an egg and add the white into the shaker. Close the shaker and dry shake for about 20 seconds to thoroughly emulsify the egg white. Now add your ice and shake until cold. Double strain into a chilled cocktail glass. Optionally layer a couple drops of bitters onto your foam. Dry shake means to shake the ingredients without ice, which is done in order to get a nice creamy foam from the egg white. Double strain means to strain your cocktail shaker through a fine mesh strainer into your glass. As well as separating out any lemon pulp and ice shards, this also helps ensure a smooth, even texture to your egg white. For best results, you should actually double strain any time you’re shaking a cocktail, especially if it contains citrus. I made this drink in honor of National Whiskey Sour day, which is apparently today. I don’t know who makes these things up but it’s a great reminder to mix up something you may not have had for a while. I love Whiskey Sours but it’s been a while so it was good to mix up a couple with dinner tonight. I made one with my usual Bulleit bourbon and one with the Canadian Club Classic I got recently. Bourbon is traditional and also my preferred way to make these, but a good Canadian Whiskey offers a nice change of pace. The drink pictured was topped with a few drops of Novo Fogo Cherry-Hibiscus bitters. Along with the Margarita, the simple Daiquiri has suffered greatly at the hands of chain restaurants and drink mixer manufacturers. I’ve had people express surprise when I mention making them, as they’ve only experienced frozen, fruit-laden monstrosities and (correctly) didn’t think that was exactly my style. But the Daiquiri deserves so much more respect that its gotten. Let’s see what we can do about that. 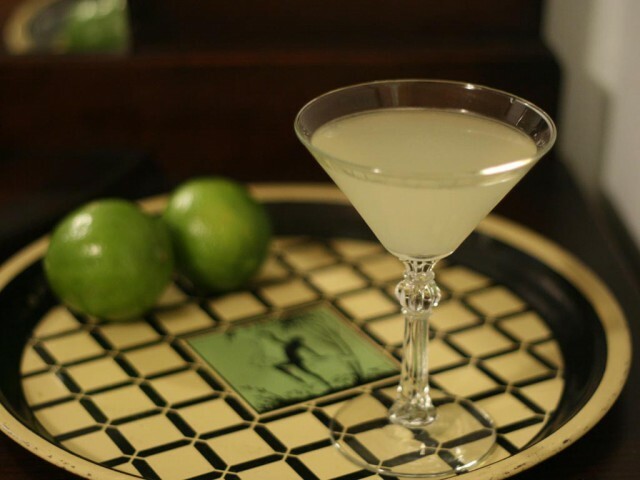 When made correctly, the Daiquiri is elegant in its simplicity. Rum, lime, sugar. That’s it. 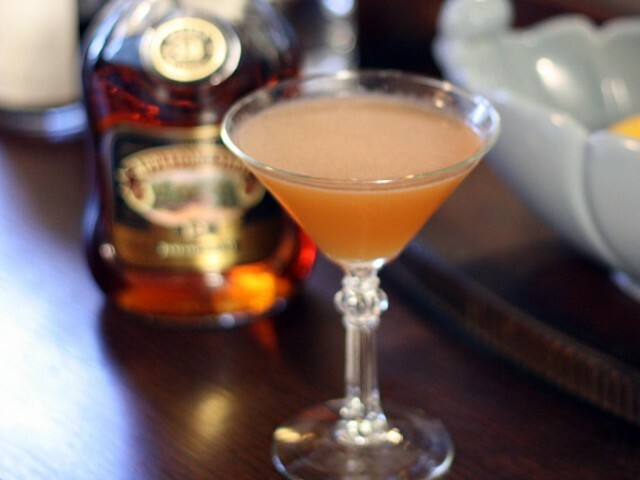 The flavor of a good rum, with the contrasting sour and sweet elements, makes a delicious and refreshing cocktail. Combine your liquid ingredients in an ice-filled shaker and shake until cold. Double strain into a chilled cocktail glass. Garnish with the lime. Enjoy. See? It doesn’t get much simpler than that. That said, the classic Daiquiri recipe is also a great foundation for experimentation. But leave the frozen mixers at the supermarket; that’s not what we’re doing here. Here are some other good ideas to get you started. Combine your liquid ingredients in an ice-filled shaker and shake until cold. Double strain into a chilled cocktail glass. This recipe substitutes aged rum for silver, giving the drink a richer taste and more complexity. The bitters round it out nicely. Here I’m using Appleton Estate 12 year Jamaican rum but any nice aged rum will work just as well. Or try combining two different rums, as you see in many tiki drinks. 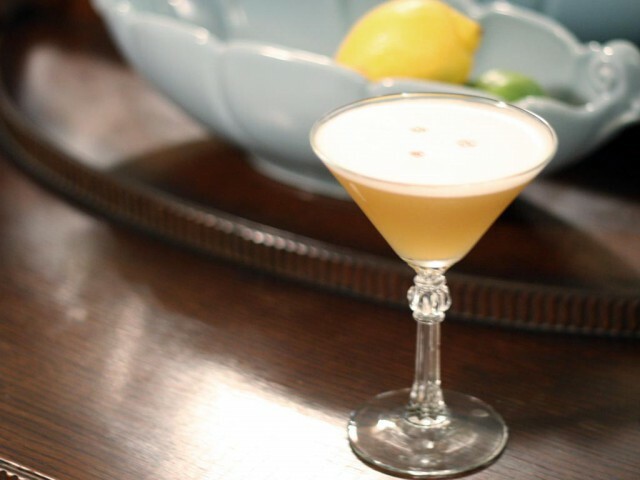 Named after Ernest Hemingway, this next version of the daiquiri was created at La Floridita in Havana, Cuba and was a favorite of the author. There are a number of versions of the Hemingway, or La Floridita daiquiri, so feel free to play around and find something that suits your tastes. The defining ingredients here are the grapefruit juice and maraschino. As above, combine everything in an ice-filled shaker and shake until cold. Strain into a chilled cocktail glass. The simple syrup in this variant is not usually necessary if you’re using a sweeter ruby red grapefruit. But if you’re not, you may find it a bit tart and the scant 1/4 ounce of simple syrup will round things out for you. 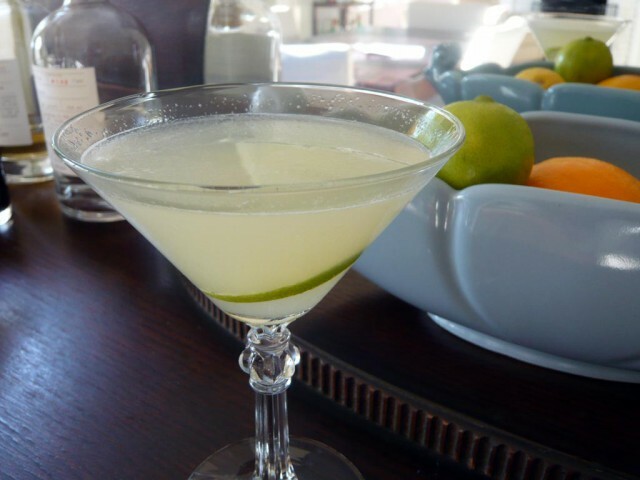 I posted another version of this drink a few years ago, as the La Floridita Daiquiri. 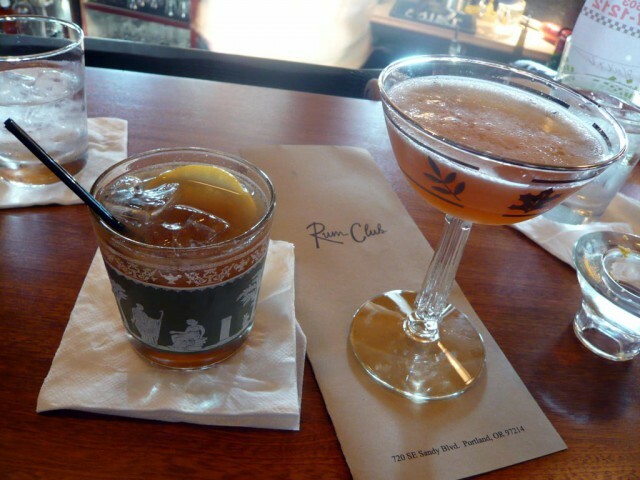 Rum Club, Portland’s newest cocktail bar, has a signature Daiquiri on their menu. This recipe is for their Rum Club Daiquiri, which can be seen on the right in the above photo. Same mixing directions as the others. Shake with ice, double strain into a cocktail glass. Like the La Floridita or Hemingway daiquiri, this recipe adds a bit of maraschino as well as just a touch of absinthe. The simple syrup here also differs from the other recipes in that it uses demerara sugar rather than white (demerara sugar is also known as turbinado or raw sugar). Where regular simple syrup is 1:1 sugar and water, this is a “rich” syrup using two parts sugar to one part water. I opened this article with a comment about “frozen, fruit-laden monstrosities” but I would be remiss if I didn’t at least touch on that aspect of the Daiquiri world. Setting aside the issue of frozen drinks, how does a thoughtful party host or bar manager accommodate those who are used to and prefer this type of thing? While most people who care about properly-made daiquiris would simply not cater to this particular preference, I think there’s a better way. Why not simultaneously give your guests something they will like and also provide a gentle introduction into more well made cocktails? Same instructions as the rest: Combine with ice, shake, strain into a cocktail glass. For extra fruitiness, garnish with a strawberry. The fine folks at Cruzan sent me a sample bottle of their new strawberry rum, which inspired the inclusion of a fruit daiquiri in this roundup. Made with a combination of their usual silver rum and a strawberry liqueur, this rum comes in at only 42 proof but offers a clean strawberry flavor. It’s also very sweet; much to sweet to simply use in place of a silver rum. 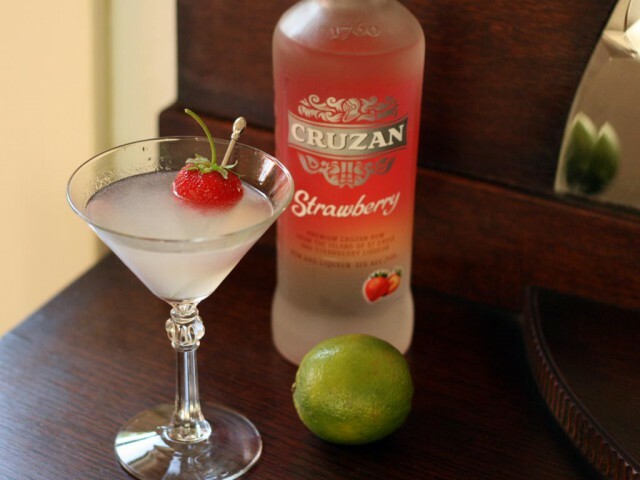 While I’m not usually into fruit-flavored spirits, Cruzan does make some good rum so I was hopeful. As it turns out, I’m not disappointed in this latest addition to their line. For this recipe I found 50/50 silver rum and flavored to provide a good balance. I also reduced the simple syrup from 1/2 to 1/4 ounce due to the extra sweetness the flavored rum brings. The end result features the tartness that a good Daiquiri should have while also having a distinct, but not overpowering, strawberry flavor. It’s not my usual sort of drink but it’s quite good in spite of that, and will certainly be good for situations like the one I described above1. Cruzan has a number of other flavors in their lineup so you’ve got room for creativity here as well. I hope this gives you some ideas for the next time you want to mix up something simple, classic, and refreshing but with a creative twist. The beauty of simple foundations is that you can build upon them endlessly. If you’d like to experiment with your rums as well, RumDood’s article, Rum 101: How To Get Started With Rum has everything you need to get your selection going. 1. I call that the “Nathan Test”, named after a friend of mine whose tastes tend sharply toward vodka and sweet.